The Brewers (17-2, 11-1 Liberty League) overcame a sluggish start and defeated Clarkson University, 77-48, Jan. 26 at the Athletics and Fitness Center. The victory extended Vassar’s winning streak to 14 games. Clarkson led, 16-11, at the end of the first quarter, but the Brewers rebounded in the second quarter, outscoring their Liberty League opponents, 28-9. Jackie Cenan ’19 led a balanced scoring attack with 14 points. Sophie Nick ’20 and Dani Douglas ’22 each added 13. Vassar used a strong third quarter to defeat St. Lawrence University, 60-45, Jan. 25 at the Athletics and Fitness Center. Cenan scored 17 points and grabbed nine rebounds. 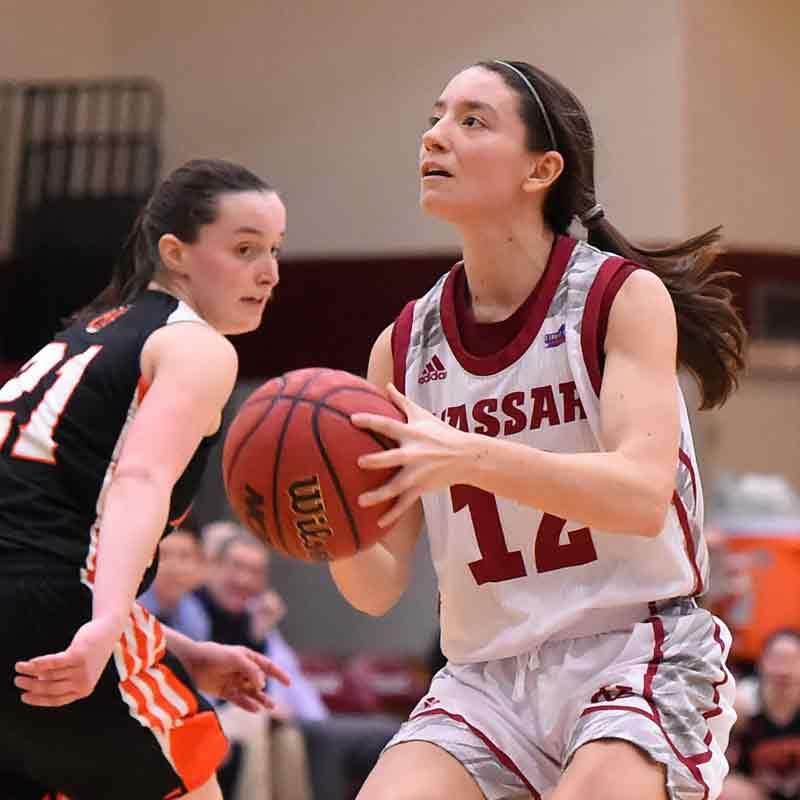 She scored 11 points in the third quarter, when Vassar extended its 26-21 halftime lead to 46-33. Nick scored 16 points, and Isa Peczuh ’20 had 14. All 11 players on Vassar’s roster scored at least one field goal in the Brewers’ 72-30 victory over Bard College Jan. 19 at the Athletics and Fitness Center. Cenan led all scorers with 14 points in 16 minutes of action. Nick had 11 points and five rebounds. Nick tallied her eighth double-double of the season to pace Vassar to a 64-50 win over Union College Jan. 18 at the Athletics and Fitness Center. Nick scored 24 points and hauled down 13 rebounds. Peczuh had 13 points, six rebounds, and two steals. Peczuh drained six three-point shots in 10 attempts, and Vassar went on to defeat Skidmore, 55-48, Jan. 15 at the Athletics and Fitness Center. Nick scored 11 points and grabbed eight rebounds, and Ryan DeOrio ’21 had 11 points and four assists. 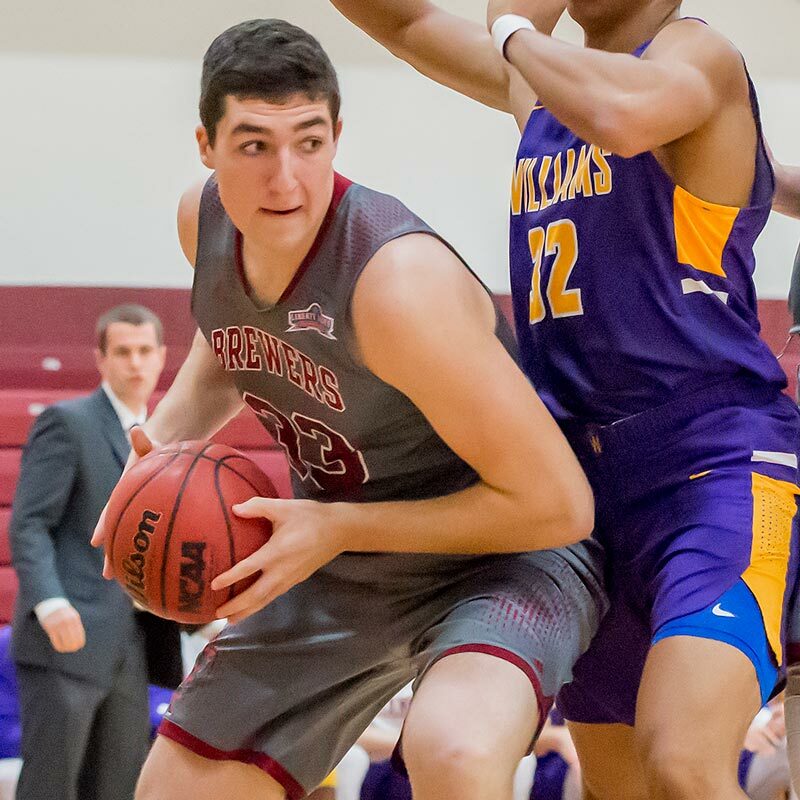 The Brewers set a program record with their ninth straight victory, defeating Rochester Institute of Technology, 74-66, Jan. 12 at the Athletics and Fitness Center. Cenan scored a career-high 30 points. Douglas was 3-for-3 from three-point range. Cenan and Peczuh combined for 38 points in Vassar’s 67-43 victory over Rensselaer Polytechnic Institute Jan. 11 at the Athletics and Fitness Center. The Brewers limited RPI to just 19 field goals in 54 attempts. Vassar used balanced scoring to defeat St. Lawrence University, 71-63, Jan. 5 on the St. Lawrence campus in Canton, NY. DeOrio, Peczuh, and Cenan each finished with 15 points. Nick added 12. The Brewers built a 45-27 lead at halftime and cruised to an 86-69 victory over Clarkson University Jan. 4 in Potsdam, NY. DeOrio led all scorers with 18 points. Cenan scored 16. Vassar (8-11, 4-8 Liberty League) finished its seven-game home stand with an 80-55 loss to Clarkson University Jan. 26 at the Athletics and Fitness Center. Zach Bromfeld ’21 and Mason Dyslin ’19 combined for 21 points. Vassar stunned Liberty League leader St. Lawrence University, 70-49, Jan. 25 at the Athletics and Fitness Center. Alex Seff ’19 scored 17 points, and Bromfeld and Paul Grinde ’19 each added 16. Bard College used a strong second half to outlast the Brewers, 73-67, Jan. 19 at the Athletics and Fitness Center. Vassar led at the half, 35-33, but the Raptors scored the first 12 points of the second half and held on for the victory. Seff became the 16th Brewer to score 1,000 points. He finished with 18. A Vassar comeback fell short, and the Brewers suffered a 65-60 loss to Union College Jan. 18 at the Athletics and Fitness Center. Grinde led all Vassar scorers with 24 points. Lance Tebay ’20 had 14. The Brewers avenged an earlier 40-point loss to first-place Skidmore, defeating their Liberty League rivals, 77-65, Jan. 15 at the Athletics and Fitness Center. Seff, Grinde, and Bromfeld combined for 46 points. Vassar used a 29-5 spurt in the first half to defeat Rochester Institute of Technology, 70-55, Jan. 12 at the Athletics and Fitness Center. Grinde led all scorers with 21 points. Seff scored 14. Rensselaer Polytechnic Institute scored the final eight points of the first half and opened the second half with a 19-6 run, defeating Vassar, 71-60, Jan. 11 at the Athletics and Fitness Center. Grinde finished with 14 points. Only two Brewers scored in double figures in Vassar’s 70-62 loss to St. Lawrence University Jan. 5 on the St. Lawrence campus in Canton, NY. Grinde and Dyslin each scored 10 points. Clarkson University raced to a 48-33 lead at halftime, and the Brewers never caught up, losing by a score of 82-74 Jan. 4 on the Clarkson campus in Potsdam, NY. Seff paced Vassar with 17 points. Grinde added 15. Vassar (6-2) finished its dual-meet season with a 161-133 win over Pace University Jan. 26 on the Pace campus in Pleasantville, NY. Brynn Lautenbacher ’21 won the 50- and 100-yard freestyle events and the 100 butterfly. Jesse Eklund ’22 won the 100 and 200 backstroke. Vassar finished second in the Seven Sisters Championships Jan. 19 and 20 at Smith College in Northampton, MA. Angharad Healy ’21 won the 1,650-yard freestyle, and Kael Ragnini ’19 finished second. Eklund, Rhea Randhawa ’21, and Rachel Yang ’22 finished 1-2-3 respectively in the 200 backstroke. Lautenbacher won the 200 butterfly. 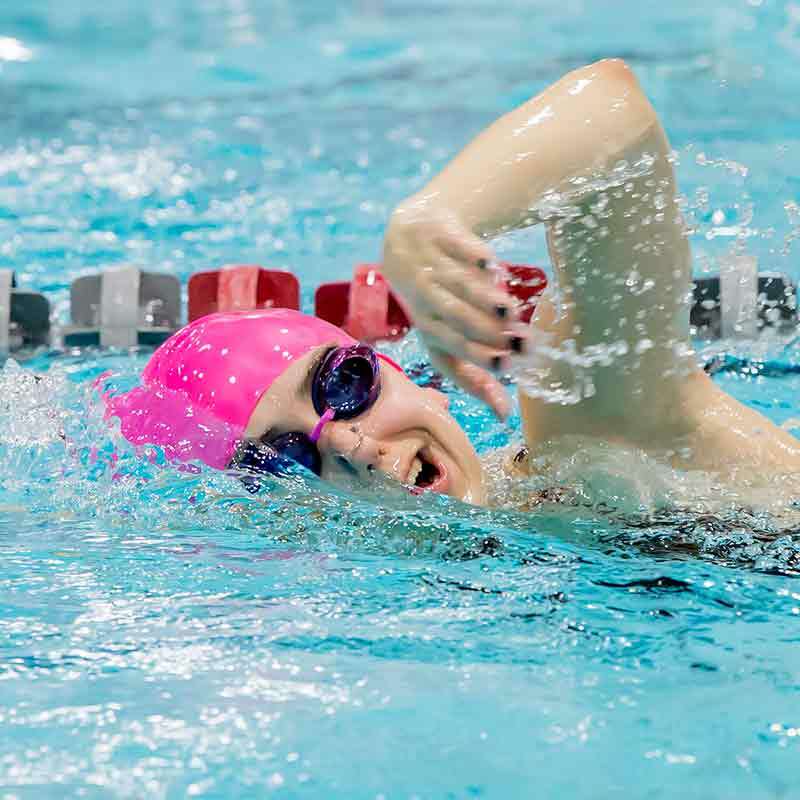 Vassar defeated Mount Holyoke College but lost to Trinity College in a tri-meet Jan. 12 in the Mount Holyoke pool. Eklund, Lautenbacher, and Hayley Schultz ’19 each won two events. Eklund won the 200-yard freestyle and the 200 backstroke. Lautenbacher swept the butterfly events, and Schultz swept the breaststroke events. Wil Riley ’22 was part of the winning 200-yard medley relay team, and he picked up a victory in the 100 breaststroke, but Vassar (3-5) lost to Pace University, 149-132, Jan. 26 in Pleasantville, NY. Jake Mier ’22 won three events, but Vassar fell to Montclair (NJ) State University, 159-124, Jan. 23 at Kresge Pool. Mier just missed the pool record in the 200-yard butterfly, posting a time of 1:57.72. He also won the 100 butterfly and the 200 individual medley. Max White ’21 won the 200 and 500 freestyle events. White won two events, but the Brewers fell to Trinity College Jan. 12 on the Mount Holyoke (MA) campus. White won the 200-yard freestyle and the 500 freestyle, and was second in the 100 backstroke. Mier won the 200 butterfly and the 200 individual medley. Vassar (3-1) opened its home schedule with a pair of victories over Rutgers–Newark and Emmanuel College Jan. 26 at Kenyon Hall. Jake Kaplan had 11 kills, and George Diehl ’19 and Yoni Auerbach ’21 each had seven in the win over Rutgers. Jefferson Waters ’22 had 11 kills, 12 blocks, and three service aces in the win over Emmanuel. Vassar opened the season by splitting a pair of matches on the campus of Ramapo (NJ) College in Mahwah, NJ, on Jan. 19. The Brewers defeated Ramapo, 3-1, but lost to Arcadia University, 3-2. 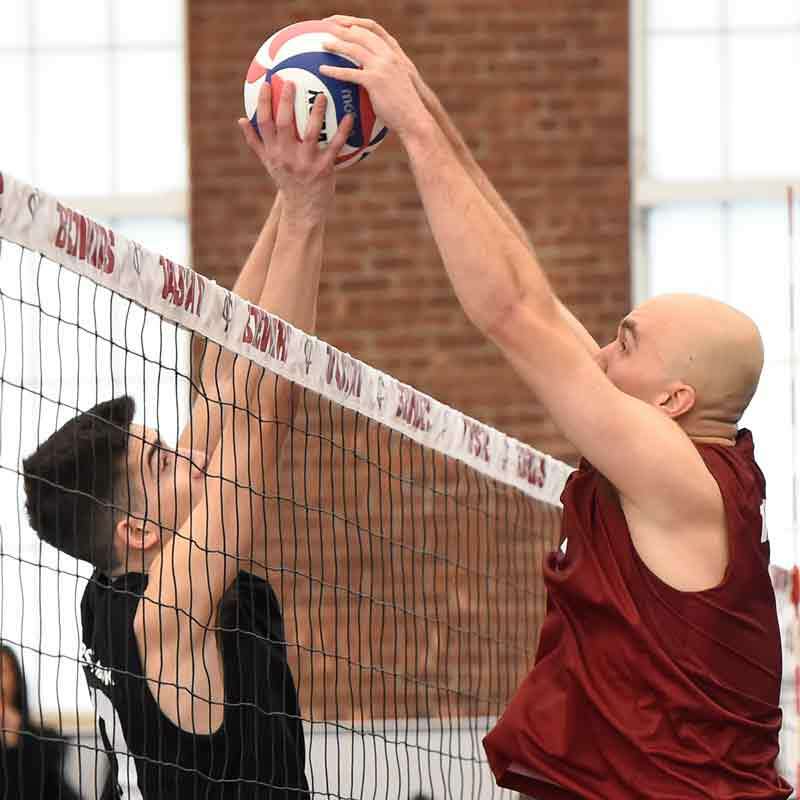 Jake Kaplan had a team-high 14 kills in the win over Ramapo, and Kevin Ros ’20 had 40 assists. In the loss to Arcadia, George Diehl ’19 led the Brewers with 14 kills, and Ros had 38 assists. Vassar (7-8) fell to Hamilton College, 9-0, Jan. 29 at Kenyon Hall. Amanda Watson ’21 played one of the most competitive matches of the day, losing by scores of 11-3, 11-7, and 11-9. No. 1 Sydney Nemphos ’20 lost by scores of 11-2, 11-6, and 11-2. Julia Pollak ’19 posted Vassar’s (7-7) lone win in an 8-1 loss to Haverford College Jan. 26 on the Haverford, PA, campus. Playing at No. 3, Pollak swept her opponent, 11-5, 12-10, and 11-6. Haverford (PA) College swept Vassar by a score of 9-0, Jan. 26 on the Haverford campus. Milind Joshi ’21 earned the only victory of the day in Vassar’s (3-9) loss to Hamilton College, 8-1, Jan. 29 at Kenyon Hall. Joshi split the first four sets and won the final set, 11-4. Vassar (21-9) split six matches at the Northeast Conference Multi-Meet Jan. 26 on the University of Rhode Island campus in Providence, RI. The Brewers defeated Massachusetts Institute of Technology, Tufts University, and Rhode Island. They lost to Brandeis University, Boston College, and Brown University. Rose Hulsey-Vincent ’19 was 3-0 in epee in the fourth-round loss to Brandeis. Tori Lubin ’22 keyed the win over Tufts with a 3-0 record in foil. Lubin and Zoe Tolbert ’22 each posted 3-0 records in foil in the win over Rhode Island. Vassar won 80 of 102 matches against squads from Cleveland State University and the University of Detroit Mercy Jan. 20 at Walker Field House. Chloe Chinnadurai ’22 won nine of 10 matches in epee. Breanna Piercy ’21 was 6-0 and Hulsey-Vincent was 5-0 in epee. Mirit Rutishauser ’19 was 10-2 in foil, and Nicoletta Dinelli ’21 won all seven of her matches in sabre. Vassar (22-15) won two of six matches at the Northeast Conference Multi-Meet Jan. 26 in Providence, RI. The Brewers defeated Tufts and the University of Rhode Island but lost to Massachusetts Institute of Technology, Boston College, Brandeis University, and Brown University. Michael Jaklitsch ’21 and Nishay Bhatnagar ’22 were 3-0 in epee in the loss to MIT. Chase Estes ’22, Thomas Dadoly ’21, and Graeme Mills ’20 were a combined 9-0 in sabre in the win over Rhode Island. Noe Berger ’20 was 2-1 in foil in the loss to Brandeis. The Brewers defeated two squads from Cleveland State University and another two from Detroit Mercy Jan. 20 at Walker Field House. Jaklitsch led the epee squad with 10 wins and one loss. Mills was 9-1 in sabre, and Berger won nine of 13 matches in foil.